I found my love for gallery walls on Pinterest one day in June and knew as soon as I had a "semi permanent" place to live for a few years I wanted to put one together. I discovered it at the beginning of the summer and so I began to slowly but surely look for things to incorporate. I found things at TjMaxx, Hobby Lobby, and believe it or not, I found old pretty frames that my mom had and wasn't using. Don't underestimate the power of older frames. They have potential! With that being said, here are my tips for creating your own gallery wall! Pick a color scheme you love and let that be the central color, you can have different shades but try to keep things in the same end of the color wheel. Find words and phrases that are important to you and mean something to you. All shapes and sizes are welcome! Decide on pictures that you love. Take the biggest items and off center them. 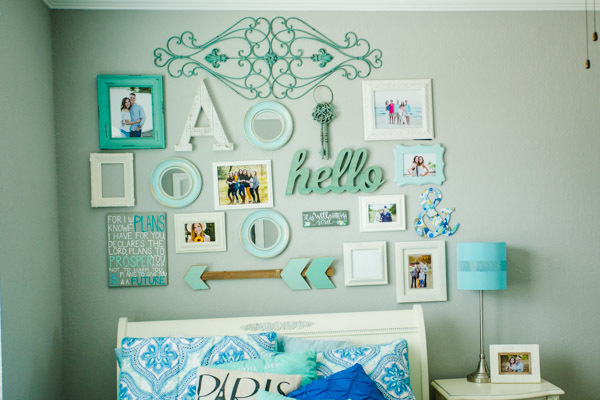 Because it's a gallery wall, not one thing is the main attraction. Treat it like a puzzle piece and put things in different directions (horizontally and vertically) to add dimension. Lay it out on your floor and once you have the final set up (I recommend having multiple sets of eyes and hands) take one thing at a time and begin to mount it on the wall. Make sure your measurements are right. Measure the wall space and then measure the set up on the floor to make sure they are exact! That about sums it up! It does take some work but the results are incredible! You can do them for any area of your house, they add such fun to any space. Take that creative license and run with it! !